The State Fair of Texas opened this past Friday in Dallas’ historic Fair Park . This annual fair premiered in 1936 as Texas celebrated the 100th anniversary of the Texas Republic. 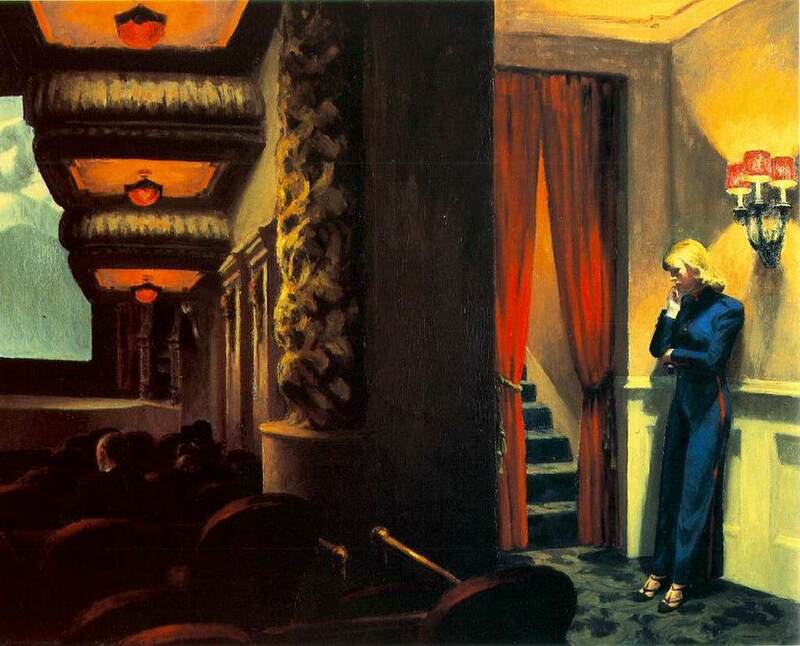 Many of the original Art Deco buildings and artwork are still intact and comprise the largest historical complex of this kind in the United States. Seventy-six years ago, world’s fairs were a popular way to introduce new products, agricultural advancements and far-away, “exotic” places to the general public as most people were not able to travel across continents as we are now. Attending the annual State Fair in Dallas continues to be a big deal. For many school districts, free tickets magically appear in teacher’s mailboxes and kids have a legit “Fair Day”, allowing schools to release early, or close completely, so kids and their families can attend on opening day. Administrators may spend hours of anxiety and suspense trying to determine if school should be cancelled for a freak snow or ice storm, but keeping school open on Fair Day? Not a chance. Personally, I never liked the fair for a variety of reasons that aren’t worth going into. I’ve only been one time and it was a major disappointment. Of course, admitting this might be grounds for people in the Dallas area to picket my house and if they also knew I wasn’t planning on voting Republican in this upcoming election, they might just tie me up and dangle me off of Big Tex’s Stetson Hat. 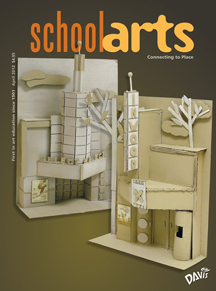 In my post last week, I wrote that my 6th grade art students had accepted the Global Cardboard Challenge. I announced to my class that their creations should be based on “carnival rides” as it related to the State Fair of Texas. Our school is an exceptionally fortunate private school and we have access to a glorious array of professional quality art materials. However, I limited their supplies to cardboard, packing tape, rubber bands, pom-poms, pipe cleaners and toilet paper tubes and I have never seen so much excitement contained within four walls! Their ideas are fantastic and I’m not sure if I’ve ever seen such enthusiasm! They are engaged, sitting on the floor, working at tables and standing on chairs to make towers and zip lines. They are having so much fun that I’ve had to raise my voice and practically kick them out of my room to go home at the end of the day. Actually, this is a good problem to have. 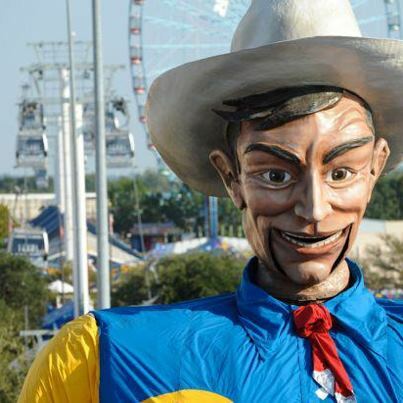 Looking for images to give them further ideas, I came across some interesting facts about Big Tex, the State Fair of Texas’ mascot. 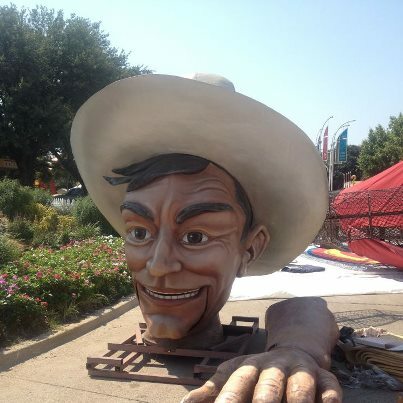 Did you know that Big Tex started out as Santa Claus? Accounts vary of Santa’s original height to be somewhere between 49 and 59 feet. Mr. Claus was made from iron-pipe drill casing and paper mache. His beard was made from unraveled, seven-foot lengths of rope. 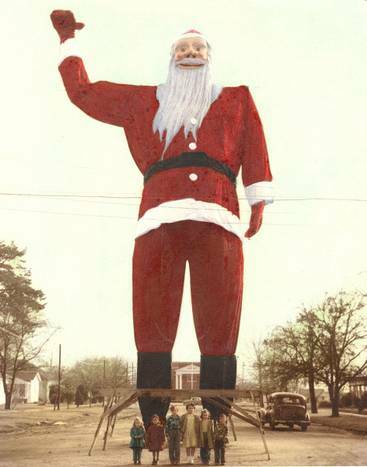 He was built to bolster the 1949 holiday shopping season in the town of Kerens, Texas, but by 1951, the novelty had worn off and Santa was sold to the State Fair of Texas for $750.00. Dallas artist, Jack Bridges, was hired to transform Santa into Tex. In her book, The Great State Fair of Texas, author, Nancy Wiley notes some interesting facts. Rising high above the crowds, Big Tex, weighs in at 6,000 pounds. He debuted in 1952, donning new jeans, a 50-pound belt and buckle, plaid shirt, 75-gallon hat and size 70 cowboy boots. Forging ahead in subsequent years, and setting the bar for Dallas reconstructive surgeries, Tex underwent cosmetic surgery to straighten his nose, hinge the jaw of his mouth so he could talk, and correct a lascivious wink. I’m not sure the surgery was entirely successful because he still looks dysmorphic and creepy and likely is the culprit of many a child’s haunting nightmares. In 2000, Tex was made to wave his hand to the crowds as they passed by on their way to dump millions of dollars on food and amusement rides down the, appropriately named, “Million Dollar Midway”. The estimated annual economic impact of the Dallas-Fort Worth economy is $350 million. Without a doubt, Big Tex is the symbol of the State Fair of Texas. Although his looks are deceiving, his famous words, “H-O-W-D-Y, folks! Welcome to the State Fair of Texas!” welcome all to come spend money, eat fried bubble gum and be entertained by gazing at large sculptures of butter. And in case you are curious, you are welcome to bring in your concealed weapon as long as you don’t take it into the Cotton Bowl. This is Texas after all.